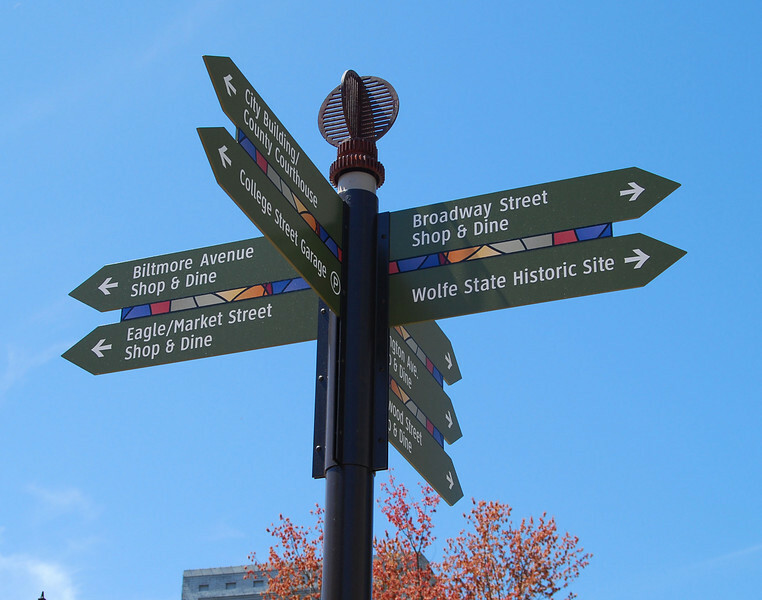 This wayfinding sign directs pedestrians and bicyclists to nearby attractions, such as shopping and restaurant destinations and historic sites. Pack Square Park in Asheville, North Carolina is said to be the realized dream of philanthropist George Willis Pack who donated the plot of land to the city in 1901. Nearly a century later, a water leak under Pack Square stimulated discussion to recreate and redesign Pack Square and City-County Plaza into a new public space, which has become the centerpiece of Downtown Asheville. The resulting 6.5 acre park, which sits in front of Buncombe County Courthouse and Asheville City Hall, is comprised of Pack Square, Reuter Terrace, and Roger McGuire Green, which is the location of Bascom Lamar Lundsford Stage. The park opened on September 25, 2009. A $140,000 Federal TE grant, procured in 2002, funded the development of the park and streetscaping around Pack Square, contiguous to three major streets: College Street, Patten Avenue, and Biltmore Avenue (US 25). In addition to the Federal funding, Pack Square Park was made possible with generous contributions by private donors.